Swirl, smear, scrape and blend colours. Ideal for use with paint, glue or sand to scrape lines or patterns for decorative artwork. 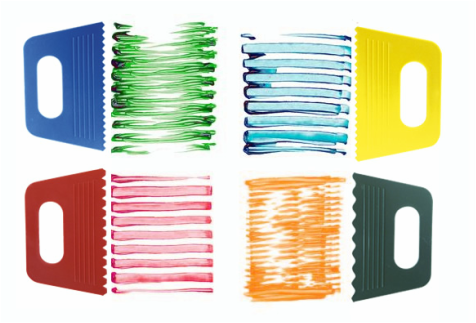 Paint scrapers encourage children to experiment while exploring colours, lines, patterns and wild textures. 4 x very different designs. The scrapers made from a thick durable plastic that children will not bend plus each scraper can be easily cleaned and used over and over again. For best results try holding scrapers at low angles. Another technique is simply scraping away paint while it is still wet. First paint a background colour and allow to dry or seal it. Then paint a shape or drip a blob of colour onto your page. 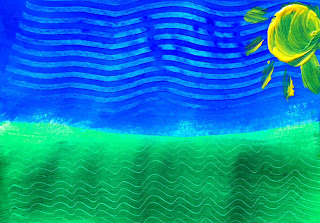 Scrape and swirl the wet paint allowing the background colour to show through. Ideal subjects: animals, trees, hair and sea. Use with paint, coloured glue or sand to scrape lines or patterns for decorative artwork. Easy to hold and clean. An ideal pre-writing tool that is just the right size for little hands. Swirl, smear, scrape and blend-paint scrapers encourage children to experiment with colours, lines and patterns in unique and creative ways. This is a quick way to make fun and colourful artworks. Children love spreading the colours around the page and making designs and shapes. 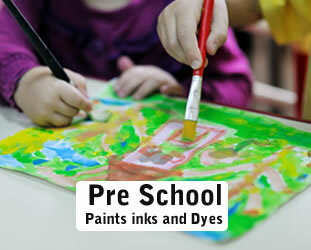 Products that are designed for use in pre-schools.